Arriving to Narvik in the early hours of the morning we didn’t know what to expect stumbling down to meet Micke Ekenstam for breakfast and a briefing of the area. We had been to Lofoten the year before and vowed to come back and explore more of this beautiful country. Micke, who is a local guide brought us a map and kindly gave us a copy of his guidebook, pointing out an overwhelming amount of touring possibilities in the area. At the end of our chat, he casually threw in that you can tour for 20 minutes from the back of the Narvikfjellet resort and find a whole playground of new terrain. We had already planned to check out the resort so this was a good starting point. What a playground it was! 20 minutes easy skinning from the top of the lift and we had bottomless untracked winter powder, huge possibilities and terrain, almost within lift access and all until 8pm. How is this place so unheard of? There is so much possibility in Narvik, so much so that Micke managed to write a whole book on ski touring in the area and we only got to page one. It is truly a hidden treasure, a Narvikfjeelt employee Harold described as ‘the Queenstown of the North,’ before realising that is where we live, I think he knew we were going to like it. The place that continues to stun its visitors year round, rain or shine, complete darkness or midnight sun. 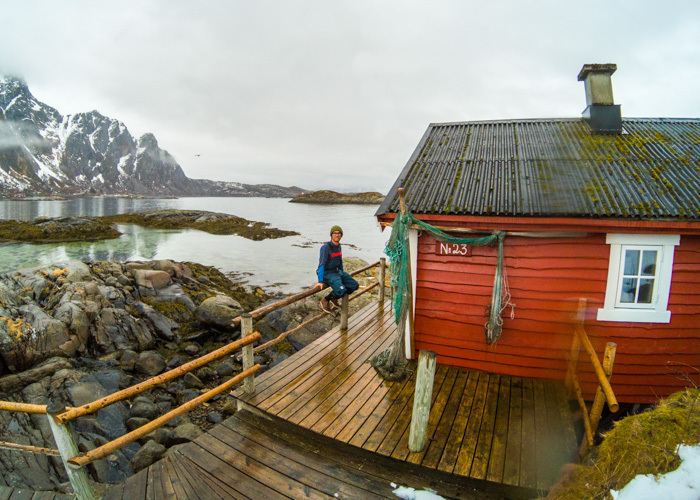 It is hard to not stop and photograph everything you see in Lofoten, from dramatic mountains plunging in to deep fjords, to the local fisherman cabins lining the shores. Lofoten was what gave us the taste for Norway last year and made us repeat from day one, ‘we’re coming back’. You need time in Lofoten and it’s never long enough. The weather changes quicker than you can buckle up your boots, so when you look out your window to a full winter blizzard falling on the sea in the morning, chances are it will be bluebird by the time you strap your skis on. 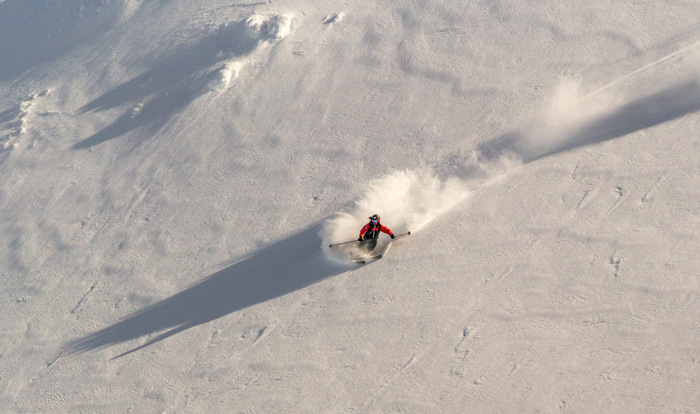 The terrain is super accessible, with decent skin tracks leading to epic terrain that the usual ski tourer visiting from Oslo strolls past on the way to their powder 8s with the rest of the gang. Thanks for the skin tracks guys! Can it get any better than combining a big blue ocean and white spectacular mountains? I think for most people it is something incredibly special. It makes us feel small and nature feels big. We get perspective of a lot of nature in one glimpse; we can imagine the fish swimming under water, the eagles fly over the mountain peaks, the white fox hunting in the snow. 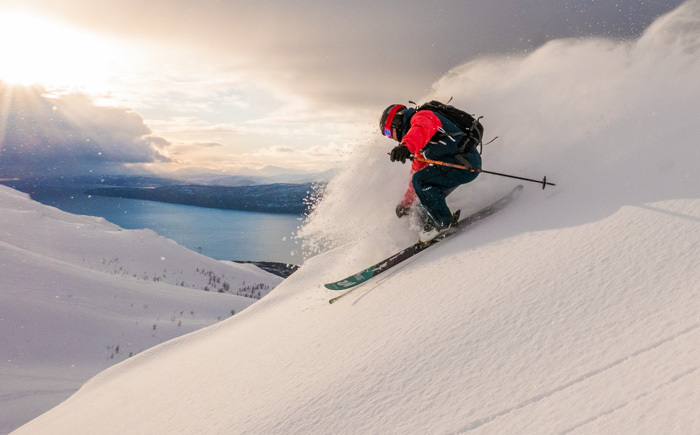 For an optimal nature and skiing experience it doesn’t get much better then northern Norway. 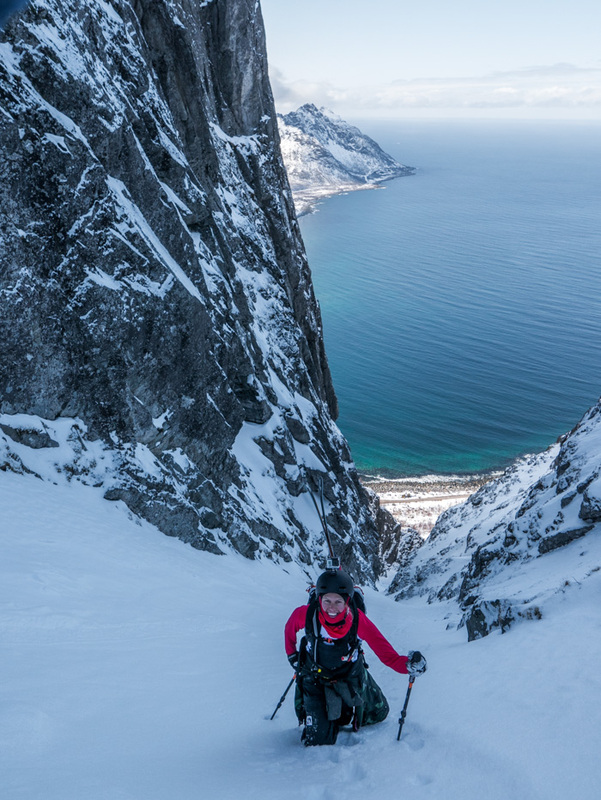 We visited the undiscovered beauty Vesterålen, a place for those who want to go ski touring and never cross another track or skier on their way up or down. To be able to find the goodies in this place we recommend getting in touch with the local guide and the-man-to-know Lasse Uppman, he simply knows everything. Next up was the island Senja, this place feels like the end of the world. From the mountain peaks you can see only ocean and other mountain summits, with minimum civilisation. The good thing is that the mountains are not so high; yes, it’s a good thing. This means you don’t have to climb so many verticals but because of the cold climate they’ve got snow down to sea level (at least this time of the year) and you can literarily ski all the way to the sea. Scoping lines from the car is a great way to explore the island and find the skiing that suits you the best. It works really well at Senja because you can start touring right from where you parked your car. For our last day we managed to score some fluffy snow in playful terrain. What a great way to finish this trip!